Moving is a part of military life that will always be a constant. Whether you’re on the go every two to three years, or you get to homestead at a duty station a little longer, at some point there will be orders in hand. And even though this component of the lifestyle has been around forever, families have been facing increasing hardships in recent years. That’s where MILLIE comes in. MILLIE was created to ease relocation burdens by helping service members and their loved ones feel at home before they even get there. Through a mix of current intel about a duty station and boots-on-the-ground professionals, the company creates peace of mind for every stage of a PCS. Scouts, for example, are scattered around the U.S. and serve as eyes and ears for all of the questions a military family may have. Gone are the days where a military spouse in California has to choose a house sight unseen in North Carolina. Instead, MILLIE’s Scouts will gather information, complete tasks, take photos, and help clients make informed decisions. Powerhouse Planning recently worked with MILLIE to help launch a new project called Agent Intel, which connects real estate agents to an exclusive subscription-based portal with tools to communicate effectively with military consumers. The goal is to streamline the PCS move for families who have anything but time to waste while also educating real estate professionals on matters important to a military client—like navigating the VA Home Loan process. Kellie Artis, COO of MILLIE, says her team’s overall focus is to help military families feel more in control of what can be an overwhelming process by giving them tools they can trust. And that trust stems from the fact that each resource is created by someone who is familiar with the military because MILLIE is built on a philosophy of “keeping it in the family.” Artis works directly with veterans and military spouses to craft each of MILLIE’s offerings. She recommends military families connect with MILLIE as soon as they hear rumblings of orders. “Most families get a rumor. You kind of know when you’re going to move…Say you have three duty stations on the table—you can go ahead and start wrapping your head around the differences,” Artis said. 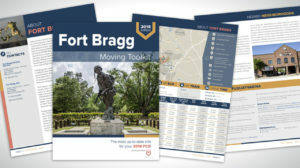 MILLIE Toolkits are free downloadable guides with information on over 70 duty locations. For example, the D.C. Metro Toolkit touches on traffic concerns by discussing distance between home and work choices. “One thing we try to do is tackle the culture shock moment right up front,” she explained. Artis also points out that researching locations early on can improve the agent-client relationship. To learn more about MILLIE’s new 2019 resources, go to www.gomillie.com.